This yummy recipe comes from another one of my new cookbooks! I talk about America's Test Kitchen all of the time and you all know how I love their recipes. These pork chops are no exception. They were delicious. It is so easy to overcook pork, which in turn, causes them to be dry. This recipe cooks them perfectly and they came out moist and tender. The sauce on top was very flavorful and it reminded me of Thanksgiving gravy. Hey, it has bacon in it!! You can't go wrong with bacon. I only cooked two pork chops, but I made the whole sauce recipe, because I like lots of sauce. This time I served them with my favorite Twice Baked Potatoes and they were delicious as always, however, next time I will serve them with mashed potatoes, so I can top them with more of that yummy gravy. Fry the bacon until crisp. Using a slotted spoon, transfer the bacon to a paper towel-lined plate, leaving the fat in the pan (you should have 2 Tbl. bacon fat; if not, add oil to make this amount). Whisk in the flour and cook over medium-low heat until golden, about 5 minutes. Whisk in the broth and bring to a boil, stirring occasionally, over medium-high heat; cover and set aside off the heat. Heat 1 Tbl. of the oil in a large skillet over high heat. Pat the chops dry with paper towels. Use a sharp knife to cut two slits, about 2 inches apart, through the outer layer of fat of each chop (do not cut into the meat). Sprinkle each chop with pepper. Brown chops in a single layer until browned on the first side, about 3 minutes. Flip the chops and cook until the second side is browned, about 3 minutes longer. Transfer the chops to a plate and set aside. Add the remaining 1 Tbl. oil to the skillet and return to medium heat. Add the onions and water, scraping up any browned bits and cook until lightly browned. Stir in the garlic and thyme and cook until fragrant, about 30 seconds longer. Return the chops to the skillet and cover with the onions. Add the reserved sauce, the bay leaves and any accumulated meat juices from the plate to the skillet. Cover and simmer over low heat until the chops are tender and a paring knife inserted into the chops meets little resistance, about 30 minutes. Transfer the chops to a platter and cover loosely with foil. Simmer the sauce over medium high heat, stirring frequently, until thickened, about 5 minutes. Discard the bay leaves, stir in the parsley and season with salt and pepper to taste. Crumble the cooked bacon. Cover the chops with the sauce, sprinkle with the reserved bacon and serve. Yield: 4 servings. I really need to start making your recipes. Guess what? You were the winner of the $45 CSN gift certificate over at Sweet as Sugar Cookies. Please get back to me within 48 hours to accept your prize. 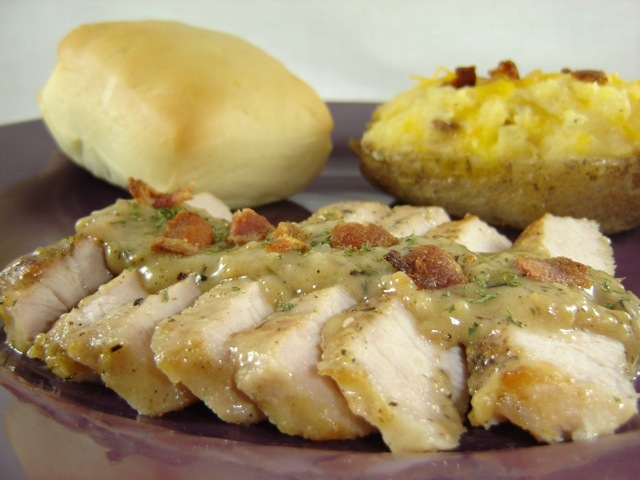 Hi five on the part on the bacon and the lots of gravy.THis meal looks so hearty and delicious! I am obsessed with America's Test Kitchen recipes too. Love them! This looks good. 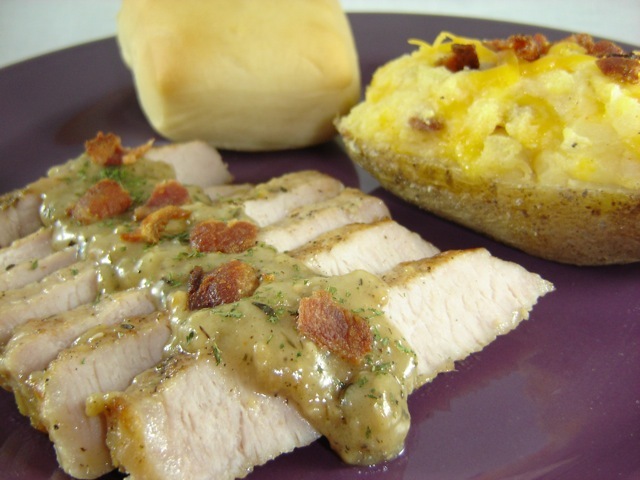 Pork chops can be hard to cook, but these look delicious! These look so good! I just started following your blog, and you're fabulous! All of your recipes look great! Can you tell me the purpose of scoring the fat on the pork chops? The chops I buy don't typically have much fat on the edges... Which cut of meat did you use? scoring the pork chops keeps them from curling in the pan so they cook evenly against the cooking surface! I am sure they put the pork chops in the oven to cook, and for a good reason. you score the fat to keep the chops from curling up. you want them to lie flat. I will be trying this recipe tonight. It sounds delicious.